As more than 900 flights have been cancelled because of Mangkhut super typhoon, I remember the hair-raising cross-wind landings on former Hong Kong Kai Tak airport. The old runways are now abandonned since the new Chep Lap Kok airport was open on the North of Lantau Island. The stories related to Kai Ta, however, remain alive. 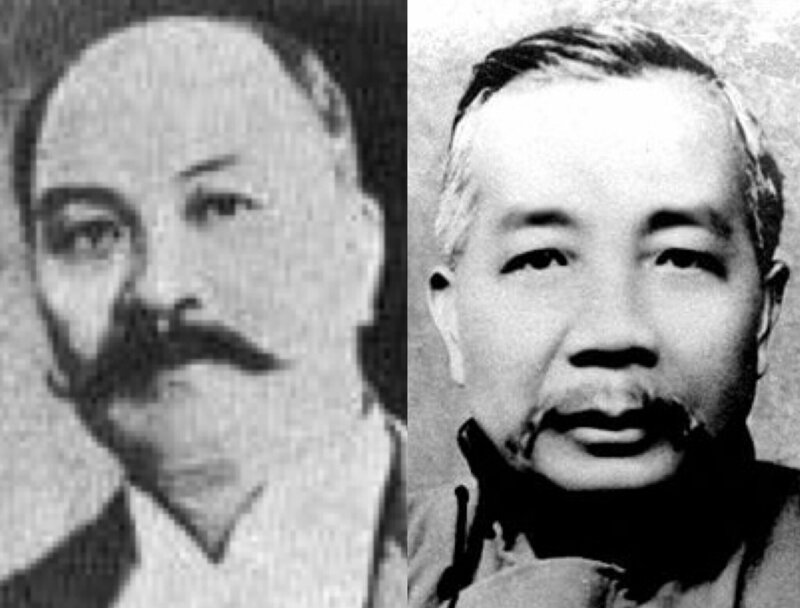 In 1912, two businessmen, called Ho Kai and Au Tak, bought a strip of reclamed land in Kowloon Bay, near the old Chinese town. Following the 1911 revolution, many immigrants came from China to Hong Kong to seek refuge, so that our two business associates planned to develop housing facilities on this piece of the land. The project however never took place and in 1924, the Hong Kong government acquired this place to create an airfield for the RAF together with a couple of flying schools. Previous to this event indeed, there was only one airfield in Shatin, on which the first plane to ever land in the colony touched ground in 1911, the so-called "Spirit of Shatin", which replica is exposed in today's airport. Kai Tak airport also harboured seaplanes starting from 1928, those stationning along two wharfs on the South side of the airfield. In 1936, the first commercial company for passengers was launched. By then, the neighbouring Chinese city of Kowloon was still surrounded by its thick walls, as a strong reminder of the Qing emperors past glory. The airstrip itself was a mere flat ground scattered with grass which welcomed the first Air France flight coming from French Indochina in 1938, a Dewoitine 338! The following year, however, a regular tarmac was available so that when the Japanese invaded Hong Kong in late 1941, Kai Tak revealed its strategic interest. It was for the new conquerors a sure and fast way to connect the rest of the controlled areas in China. They even decided to build a second concrete runway which would cross the already existing one. For this purpose, they used the POW forced labour to demolish the Chinese city ancestral walls and Song dynasty bridge and spray the debris as the fundation of the new runway! 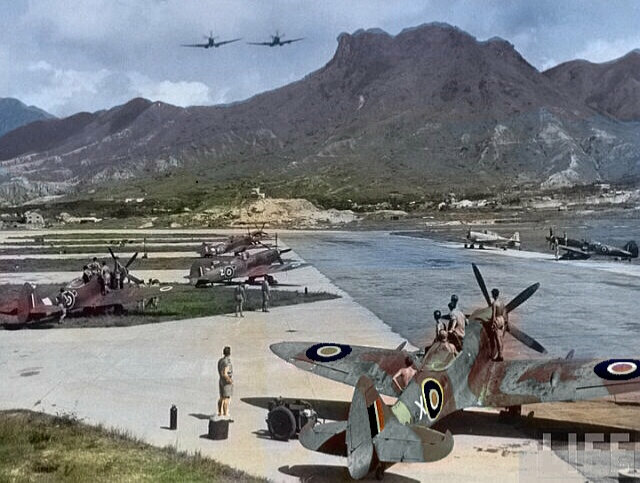 After WWII, the Royal Air Force 80th Squadron was stationned in Kai Tak, operating a bunch of legendary Supermarine Spitfires. Neighbouring communist China had indeed become a new potential threat for the British colony and it was important to carefully observe the moves along the new border of the so-called "Free World". 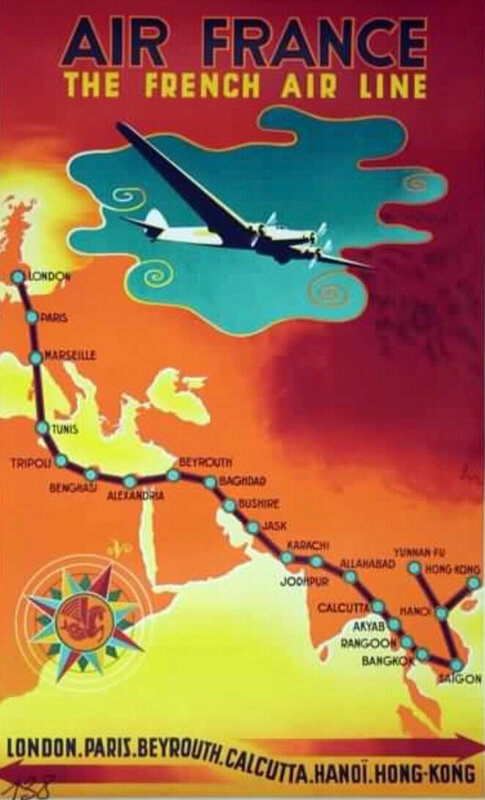 Hong Kong soon became a major destination for Western passengers in Asia so that other flying legends like the iconic Lockheed Constellation, a three-tailed and four-propelled-engines airplane, landed in Kai Tak on a regular basis. She will remain in service until the begining of the 1960s, being replaced after this date by turbo jets, therefore ending the heroic era of propelled aviation. 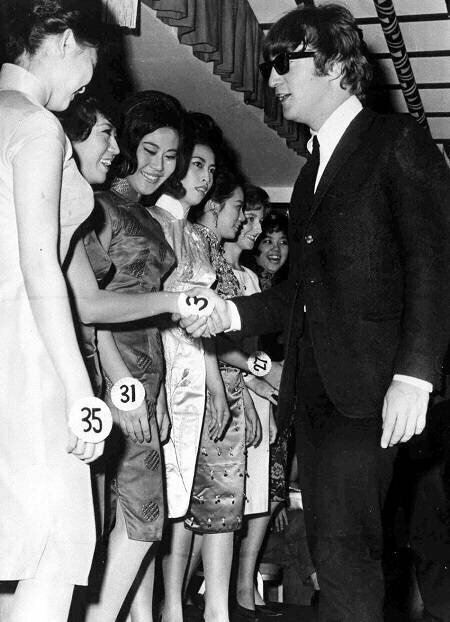 As the main entry door to Hong Kong territory, Kai Tak became favorized by paparazzi, looking for celebrities pictures. The early movie stars used to have their portrait taken in front of the flying club hangars, a trademark for modernity on the same model as Shanghai 1930s. Then movie stars departing for or coming back from US were top targets for professional photographs eager to make the font page of gossip newspapers. The peak of this fashion was undoubtly the arrival of the Beatles on 9th June 1964. The Fab Four or let's say Fab Three as Ringo Starr was replaced by Jimmie Nicol after diagnosed tongsillitis, attracted hundred of young fans at the airport terminal for there one day stop and evening gig en route for Australia! Film actors like Bruce Lee or James Coburn later fancied having their picture taken while waiting for their final boarding call. The legend of Kai Tak also comes from its particular layout. In 1958, the famous runway 13 was built by reclaming a long strip of land on the bay. Therefore, some of the world's scariest landings took place there (video). Pilots had to operate a 47 degrees right-turn in front of the mountain before diving onto the runway. 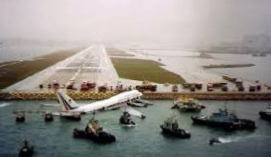 Some got directly into the habour, just like this China Airline flight in 1993. Then, because of frequent typhoons, some planes had to try delicate cross-wind landing, leaving their passengers with the fear of their lives! Kai Tak certified pilots rained on flight simulators. The "chessboard hil", a white and orange rectangle was the only indication of the moment when you had to operate the steep turn and descent to the runway. Take-off was not a piece of cake either as you had to avoid crushing into the surrounding mountains right after leaving ground. In 1965 and 1967, two deadly accidents resulted in 59 and 24 casualties. From the 1970s on, the rapid economic growth of Hong Kong led to a further increase of air traffic. At that period, Boeing 747 flew at only a few meters above some of the most crowded urban areas in Hong Kong like Kowloon City (banneer). 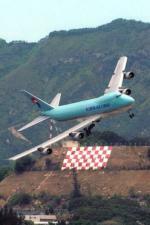 This unbearable situation ultimately led to the closing of Kai Tak in 1998 and its replacement by Chep Lap Kok. Even if a redevelopment project was promptly proposed, it took some fifteen year to become reality! In addition to the current sea cruise terminal, the iconic former runway 13 should receive office buildings and shopping malls, bringing back a bit of life into this place of history.